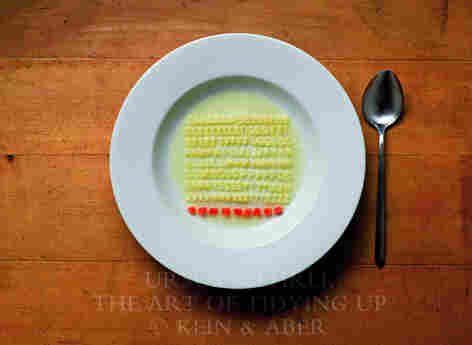 Extreme Tidying Up : Krulwich Wonders... Have you ever wanted to alphabetize a bowl of alphabet soup? 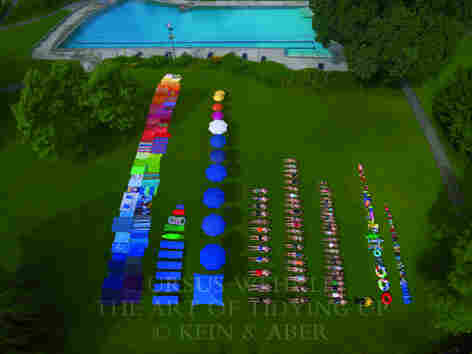 Swiss artist Ursus Wehrli did just that. The very tidy man also fixed up a haphazard parking lot and a photograph from the depths of the cosmos. There are levels of tidiness. 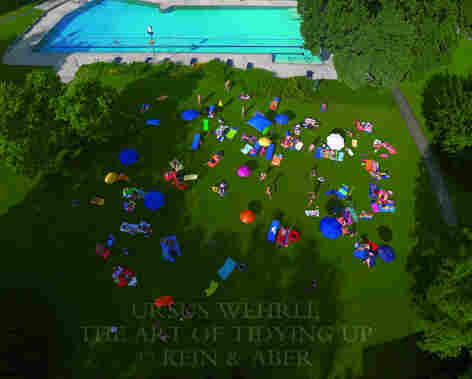 Ursus Wehrli is in Category Three. He is a Swiss artist and comedian, who may or may not have an OCD problem. 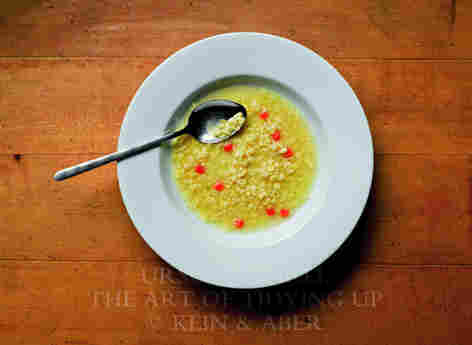 Here, for example, is a bowl of alphabet soup he tidied up. "We Swiss are famous for chocolate and cheese," Ursus Wehrli told a TED Conference. "Our trains run on time. We're only happy when things are in order." Which may explain how he was able to recruit a bunch of totally cooperative Swiss kids, moms, dads, grandparents to come to a local park to hang out, after which they were re-sorted by gender, age and size. Wanna see how he did this? Here's the Behind-The-Scenes video, Ursus directing, in his very pressed three piece suit. We originally had a bunch more photos on this page, all from Werhli's new book, The Art of Clean Up (or Die Kunst, Aufzuraumen, from Kein & Aber), but the publishers asked that we remove them. They worried that we were overexposing the work. We, of course, obliged. It's our (rather, my) opinion, that Ursus Werhli's tidy reordering of spruce branches, crowded parking lots and stars in the sky would only enhance sales. The man will neaten anything, and our blog post became a hodgepodge of wildly different photos, but perhaps the publishers (are they German Swiss?) found our blog page a wee bit too ... messy. Ursus Wehrli has been at this for a while. He has a couple of books called Tidying Up Art (Prestel Publishing, 2003) and More Tidying Up Art (Scalo Publishing 2007), which tidy up the elements in famous paintings.